Founder Lauren Wimmer’s attraction to the symbolism and texture often associated with beaded jewelry, in addition to her background in fine art and classics, has inspired the themes in her latest jewelry collection. Lauren’s jewelry strives to reflect these themes in their wearers, as each piece juxtaposes beads of all shapes and textures with a variety of colors, weights, and refractions. The jewelry’s strong global feel has helped place her product in many international markets. After launching in 2003, Lauren Wimmer Jewelry has gone on and sold in many museums and specialty stores around the world, including The Art Institute of Chicago, Bergdorf Goodman, and The Institute of Contemporary Art in Boston. The collection highlighted on The Grommet includes a number of pieces from her “Wrapped” collection, which features hand-dyed silk ribbon wrapped around hollow tube rings to form elegant and subtle bibs, chains, and convertible pieces. 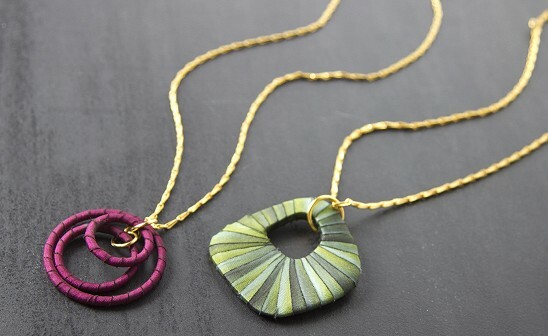 Add a little color and individuality with a necklace or set of earrings to your daily wear. Founder Lauren Wimmer’s attraction to the symbolism and texture often associated with beaded jewelry, in addition to her background in fine art and classics, has inspired the themes in her latest jewelry collection. Lauren’s jewelry strives to reflect these themes in their wearers, as each piece juxtaposes beads of all shapes and textures with a variety of colors, weights, and refractions. 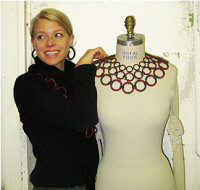 The jewelry’s strong global feel has helped place her product in many international markets. After launching in 2003, Lauren Wimmer Jewelry has gone on and sold in many museums and specialty stores around the world, including The Art Institute of Chicago, Bergdorf Goodman, and The Institute of Contemporary Art in Boston. The collection highlighted on The Grommet includes a number of pieces from her “Wrapped” collection, which features hand-dyed silk ribbon wrapped around hollow tube rings to form elegant and subtle bibs, chains, and convertible pieces.